Claude Monet: The Painter Who Stopped the Trains by P.I. Maltbie, illustrated by Jos A. Smith. (Grades 2-5.) Abrams Books for Young Readers, September 2010. Unpaged. Review copy provided by my local library. This book is a nominee for the 2010 Cybils Awards and this review reflects only my own opinion. Claude Monet didn't like being called an Impressionist. When he was alive and working, the term was meant to poke fun at the new generation of artists who painted outside with bright colors and visible brush strokes, taking inspiration from the scenery and towns around them instead of from ancient myths and historical events. So, when Monet was invited to participate in a show with a couple of his artist friends, he tried to think of something that would wow viewers and critics. And then it came to him: Trains. The year was 1876 and trains were the thing. They were the most modern and fastest mode of transportation. Trains were changing everything, and Paris was charging forth into the future. Claude Monet wanted to paint the trains and capture the billowing smoke and how the light played through it. But first, he had to get the station master to agree to stop the trains, just for him. Well, Monet dressed up in his fanciest suit and the director of the Saint-Lazare train station agreed to delay the trains so that he could paint them. And guess what? People liked it. What I love about this book is that it tells a small tale - a story of Monet painting the trains - but it conveys so much more information than just that little bit of Monet's life. The text and illustrations work well together to create a feel for the time. You know, I can hear a train outside my window as I type this (the tracks are lamentably close to my apartment complex) and I realize that we've lost much of our sense of wonder in trains. But back then... They were the harbinger of technology, of the modern age. And, artistically speaking, maybe Monet was, too. And ohhh the author's note! It fills my heart with joy! It spells out exactly what was fictionalized and adds additional factual details about the events that happened in the book. A small reproduction of one of Monet's train paintings and a photo of the actual station are included. Also included is a list of museums where Monet's paintings can be found, as well as a bibliography and an index. The artist's note includes information about what research he did to replicate the time period and his decision not to emulate Monet's art in the illustrations, but rather to create something new. Altogether, I think this is a fantastic example of children's nonfiction. And hey, it made me want to go look at Monet's art, which might be the best reaction an author could hope for. 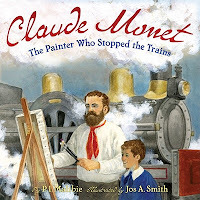 Claude Monet: The Painter Who Stopped the Trains is on shelves now! Happy Nonfiction Monday! The roundup is at Playing by the Book!